Dragon Ball Z: The World's Strongest (Japanese: ドラゴンボールZ　この世で一番強いヤツ, Hepburn: Doragon Bōru Zetto: Kono Yo de Ichiban Tsuyoi Yatsu), also known by Toei's own English title The Strongest Guy in the World, is a 1990 Japanese animated science fiction martial arts film and the second feature movie in the Dragon Ball Z franchise. It was originally released in Japan on March 10 between episodes 39 and 40 of DBZ, at the "Toei Manga Matsuri" film festival along with the second Akuma-kun movie (Welcome To Devil Land) and the 1990 movie version of Sally the Witch. While looking at the Dragon Radar, Oolong notices that all of the Dragon Balls are starting to be gathered together. He and Gohan, who were also searching for the Dragon Balls, head out to investigate and end up at the Tsurumai-Tsuburi Mountains’ eternal wall of ice, where coincidentally, Piccolo is also training. Dr. Kochin summons Shenron and wishes for Dr. Wheelo’s lab to be released from the ice. The ice begins to break away and a building emerges. Gohan and Oolong look on in disbelief, when they are suddenly attacked by Dr. Kochin’s Biomen. Piccolo shows up to save Gohan, but is overcome by three mysterious fighters, while Gohan and Oolong escape. Dr. Kochin and his Biomen soon appear at Kame House, and request that Master Roshi come with them. He refuses and easily defeats the Biomen, but Dr. Kochin kidnaps Bulma to force Master Roshi to go back with him to the lab. There, Master Roshi is forced to fight three bio-warriors, but it soon becomes apparent he’s no match. Bulma discovers that Dr. Wheelo’s goal is to obtain the body of the strongest man so he can be revived. Bulma informs them that Son Goku is now the strongest man in the world. Oolong informs Goku of the situation, and he heads out to find Bulma and Master Roshi. He arrives at Dr. Wheelo’s lab and is greeted by Misokattsun, Kishime, and Ebifurya, Dr. Kochin’s three bio-warriors. Goku defeats Misokattsun by bursting through him with the Kaiō-Ken, but is then sealed up in ice by Ebifurya. Gohan and Krillin arrive to back him up, but are at their wit’s end against Kishime. Using the Kaiō-Ken, Goku breaks free from ice and defeats the two remaining bio-warriors. Goku confronts Dr. Wheelo, demanding he give Bulma back, but Dr. Wheelo just wants Goku’s body. Piccolo, who has been brainwashed by Dr. Wheelo, appears and a battle between the two rivals commences. Gohan tries to stop Piccolo, but he simply swats Gohan away. Being unable to stop them from fighting, Gohan’s anger explodes, shattering Dr. Wheelo's brainwashing device on Piccolo. Dr. Wheelo is stunned by Gohan’s power and decides he must fight Goku himself. He begins to break his robot body free from the wall, subsequently knocking Dr. Kochin down an energy shaft, killing him. Everyone watches on in horror, including Krillin, who has freed Bulma. The true battle begins, and Dr. Wheelo seems to have the upper hand. Even the three-person Kamehameha of Goku, Master Roshi, and Krillin has no effect on him. Soon, Goku and Piccolo are the only ones left able to fight. Goku resorts to using a Kaiō-Ken powered Kamehameha, which merely knocks Dr. Wheelo into space. Goku begins to form a Spirit Bomb, but Dr. Wheelo interrupts him before he can throw it by shooting ki blasts at him. The others fly up to distract him so Goku can successfully throw the Spirit Bomb. Goku lets it fly and it’s a direct hit. Dr. Wheelo’s brain is destroyed and peace once again returns to Earth. Dr. Willow (Dr.ウイロー, Dokutā Uirō, known as Dr. Wheelo in Funimation's English dubs) is a brilliant scientist who performed experiments in biotechnology. He is the primary antagonist of the movie The World's Strongest. His name is a pun on "Uiro", a type of Japanese cake. Dr. Wheelo's ultimate goal was to modify the human race using his science. He was about to die before he could realize his goal, but Dr. Kochin, his faithful servant, saved his brain and turned him into a cyborg. Unfortunately for them, their fortress became stuck under ice with Wheelo inside. Dr. Kochin came through for his creator a second time fifty years later when he gathered the Dragon Balls and wished for Shenron to thaw the ice-enshrouded fortress. Freed from his frozen sleep, Dr. Wheelo became obsessed with finding the world's strongest man so that his own brain might be transplanted into it. He sent Kochin and Bio-Men to find this man, and at first they thought it was Master Roshi, but when Kishime, Misokatsun and Ebifurya (his Bio-Warriors) easily beat Roshi, Dr. Wheelo started to doubt they had the right person. He then went after Goku's body. When Dr. Wheelo's further attempts to subdue Goku met with failure (such as using a special device to make Piccolo fight Goku and Gohan), the enraged scientist decided to kill him and all his friends. When that also failed, Dr. Wheelo decided to just concentrate the energy contained within his laboratory's power core to fire a gigantic wave and destroy the entire world. Goku was able to form a Spirit Bomb and used it to overpower Dr. Wheelo's attack and destroy the robotic scientist for good. Dr. Wheelo also appears on the Dragon Ball Z: Fusion Reborn poster, but he is not featured in the movie. A fourth English version released exclusively in Malaysia by Speedy Video features an unknown cast. The Toonami version replaced "CHA-LA HEAD-CHA-LA" and "Ikusa" with Shuki Levy's "Rock the Dragon" but kept the original Japanese background music. The score for the 2006 English-language version was composed by Nathan Johnson. However, the remastered release contains an alternate audio track containing the English dialogue and Japanese background music. It was released on VHS and DVD in North America on May 26, 1998, with an English dub, produced by Pioneer Home Entertainment in association with Funimation. Pioneer's dub used the original Ocean Productions voice cast of the TV series. The film was later re-dubbed by Funimation's in-house voice cast and released again to DVD on November 14, 2006, in a box set titled "First Strike," which included Dead Zone and The Tree of Might with "Ultimate Uncut Edition". It was later remastered and released in a Double Feature set with Dead Zone on Blu-ray and DVD on May 27, 2008. 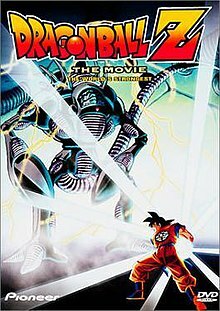 The film was released to DVD again on November 1, 2011, in a remastered box set containing the first five Dragon Ball Z movies. Also, Funimation was released this movie on the Rock the Dragon Edition box set on August 13, 2013 with Ocean dub, with 53 edited episodes of the series, plus two movies of Dead Zone and The Tree of Might (Movie Edited Version). Outside of the US, there have been two other English dubs of this movie: one in Malaysia and one by AB Groupe in France. The Malaysian English dub was released to VCD in Malaysia, while AB Groupe's English dub aired on TV in the Netherlands, the United Kingdom, and Ireland, as well as seeing a home release to VHS and DVD in some of the formerly mentioned countries. Both dubs use Toei's official English title rather than Funimation's title, and until recently, the voice cast of the AB Groupe dub version was unknown, but then it has been determined that they used voice actors who were involved in French TV shows like Code Lyoko, while the Malaysian dub's cast remains unknown.